which features an insert. Remove the insert as it has to be used as a pattern in the new mosaic top. Clean the insert and refinish by painting the base of your coffee table. You can choose a table which comes with slim lines, low profile and ample top. Go for sturdy coffee tables as they can give your house a contemporary look. These tables are a great accent piece for your place. Now cut out a piece out of plywood. This piece should be equal to the original insert. Sand the edges of this piece and draw a design you want to use for your mosaic. You can use a permanent marker to trace the outline. Make sure you protect your eyes and body during this project. You can use a bath towel to prevent the tile pieces from flying. Wear safety glasses and take a hammer for the next step.
. These buckets hold all the pieces so that they don’t get scattered on the floor. Available in many colors and sized, they are made of sturdy food-grade high density plastic. You can use these tough buckets for many other purposes. Now you can glue the broken pieces and arrange different colors in the design you have created. Use tile adhesive to glue the pieces. Start making the grout once the design is complete. Mix the colored grout as per the directions written on the package. Spread out the grout to cover the entire surface. Make sure you cover all of the cracks of the table. Now remove the excess grout and wipe off with a damp sponge. 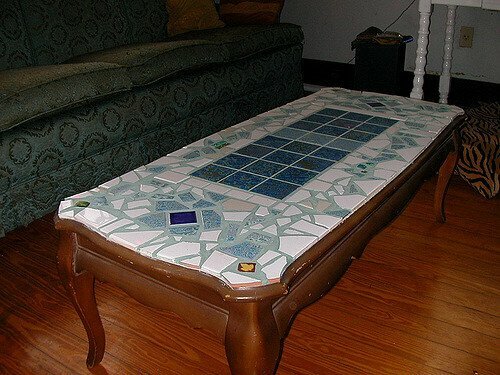 You can insert the beautiful mosaic insert onto the coffee table once the table is completely dry. Making a special coffee table is easy and fun. All you have to do is follow these simple steps, take the important precautions and there, your personalized table is ready!